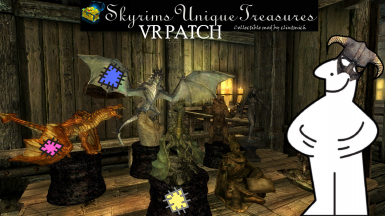 This patch changes Skyrim's Unique Treasures by clintmich and icecreamassassin to play nicely in VR. Skyrim's Unique Treasures is by icecreamassassin and clintmich. See the mod's page for a full list of credits and thanks for the original mod. This patch is just a fix for an issue with Skyrim's Unique Treasures﻿ by clintmich﻿ and icecreamassassin﻿ which made it unusable in VR. There are three versions of Skyrim's Unique Treasures - Full, Lore Friendly and Immersive. In the original patch, you choose which of these you want from a prompt that comes up when you start the game. In VR, however, that prompt comes up over the top of the "Press Any Button" prompt, making both prompts unclickable. How does the patch fix it? Basically it gets rid of the prompt. Don't worry, you can still choose which version of the mod you want. You just choose it in this patch's FOMOD installer rather than ingame. Just use your mod manager to install this right after Skyrim's Unique Treasures. It only replaces one script, so it should be compatible with everything the original mod is. It still requires the original mod to run. It should work fine in regular SSE too, if you want to get rid of the prompt for whatever reason. Many thanks to icecreamassassin and clintmich for the original mod and for permission to patch.